I've previously reviewed an audio book featuring Francis Durbridge's famous creation Paul Temple: Paul Temple and the Madison Mystery in which a writer turns sleuth in the upper end of society. Tim Frazer's isn't quite so high-brow. Frazer is an engineer who has recently begun working for a secret police/Government department. In this, his second case, he is sent to Amsterdam to shadow Barbara Day. Barbara Day recently ran over and killed a British agent, Leo Salinger, on one of her regular trips to Amsterdam. Was it an accident of something more sinister? This is a complicated story with many twists and turns which kept me hooked. It's action-packed with fights, dangerous men, and a hidden baddie who instils mortal fear in his underlings. Written in the 1960s we see the quaint use of telephone boxes rather than disposable mobile phones. 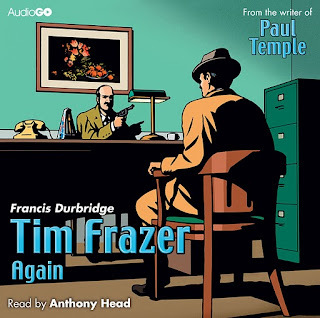 I really enjoyed Tim Frazer Again and Buffy and Merlin's Anthony Head narrates very well with a variety of convincing accents and a low breathy voice for Barbara Day. He also plays Tim Frazer in 2010's The World of Tim Frazer and I'll be looking out for his Paul Temple audio books too. Karen - Thanks for this fine review. I have to say, something in me finds those days of telephone boxes and so on appealing. Perhaps it's because I'm getting older. No, couldn't be that ;-). The Durbridge audio books are one of my guilty pleasures. Great fun. I'll look out for this one.